4 Bedroom Semi Detached House For Sale in Barnet for Asking Price £999,999. 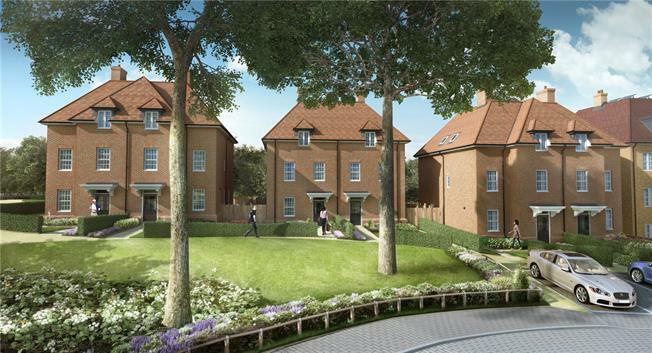 The Alba, a 4-Bed/3-Bath Semi-Detached family home that forms part of this collection of new 1, 2 & 3 Bedroom Apartments and 3, 4 & 5 Bedroom Houses located in Arkley. Each new property for sale has been individually planned and will boast sleek designer kitchens, luxurious bathrooms and high specification throughout. - Kitchen with units from the Symphony New York range, Quartz worktops and upstand, inset 1½ bowl stainless steel sink with chrome mixer tap, AEG stainless steel eye level single oven and 60cm gas hob, Stainless steel hob, AEG stainless steel eye level microwave & grill, Electrolux stainless steel chimney hood and splashback, Fully integrated Zanussi fridge/freezer. Zanussi dishwasher, Zanussi washer dryer, Porcelanosa ceramic floor tiles. - Two Ensuite Bathrooms to Bedrooms 1 & 2. - Bathrooms, Cloakrooms & En-suites all have standard sanitaryware with contemporary chrome fittings with Porcelanosa wall and floor tiling. - Living Room with Juliette Balcony. - Gas fired heating feeding radiators fitted with thermostatic valves. - Double glazed white timber mock sash windows. For further information and to arrange an appointment, please contact Preston Bennett New Homes on 0208 954 8626.